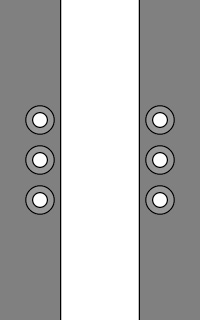 Not a lacing method as much as a technique for creating a super-tight finish. It's often recommended to help reduce heel slippage in running or climbing shoes. 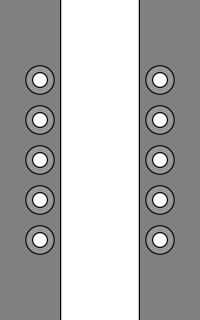 Also referred to as "Lace Lock", "Loop Lacing Lock", "Heel Lock" or "Runner's Tie". • Lace the shoe up to the second-from-top eyelets using any lacing method (eg. Criss Cross Lacing is shown here). • The ends run straight up on the outside and in through the top eyelets. • The ends are crossed, then each end is fed under the vertical section on the opposite side. • The ends are returned to the middle for tying, pulling the vertical sections inwards. • Lace the shoe up to the third-from-top eyelets using any lacing method (eg. Criss Cross Lacing is shown here). 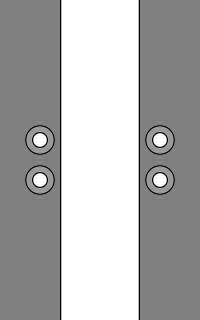 • Cross the ends, feeding under the sides and out through the top eyelets. • The ends run straight down on the outside and in through the second-from-top eyelets. NOTE: This variation results in the knot sitting slightly lower than variation 1. • Lace the shoe up to the top eyelets using any lacing method (eg. Criss Cross Lacing is shown here). • Each end is looped back on itself and fed back into the same eyelet from which it emerged. • The ends are crossed, then each end is fed through the loop on the opposite side. • Pull the ends to tighten the loops before returning the ends to the middle for tying. NOTE: This variation doesn't provide the same tightening as either of variation 1 or 2, though it does lock the lace more tightly, which helps with slippery shoelaces. • Lock Lacing is also used by rock climbers to prevent any movement or twisting of the shoe under the stresses of climbing as well as by speed skaters to give maximum ankle support. • Although Criss Cross Lacing is shown in these examples, and is probably the most common method used, the shoe can be laced with almost any lacing method. In fact, as pointed out by Kyle B., Ladder Lacing naturally ends with a High Lace Lock. • Lock Lacing is one of the suggested odd workarounds for implementing Straight Bar Lacing on shoes with an odd number of eyelet pairs. • Lock Lacing also creates more friction, which should help prevent the knot from coming loose, especially with slippery synthetic shoelaces or if you are unknowingly using a Granny Knot. Replacing slippery shoelaces or changing your Shoelace Knot are better alternatives. Many shoe stores recommend Lock Lacing techniques to help prevent heel slippage, particularly when running downhill, and many people swear by them. In fact, many sports shoes have twin eyelets at the top to suit Lock Lacing. So what's behind the "magic"? The answer is simple leverage. 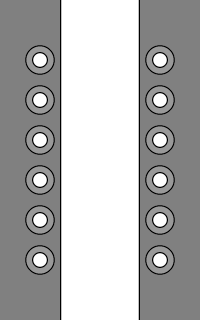 While pulling the lacing tight, the upper straight sections get pulled into a triangular shape, acting like "pulleys" to provide even greater tightening. When shopping for shoes, don't be too impressed by a savvy shoe salesperson using Lock Lacing to get a slightly better fit from an unsuitable pair of shoes! If you've found some shoes that meet all of your other needs with the exception of a bit of heel slippage, then Lock Lacing could be the ideal solution. However, if you suffer from a fair bit of heel slippage, Lock Lacing will only help so much, and it could be wiser to seek some better fitting shoes. Reebok ERS6000s with Lock Lacing. Lengths available: 27" 36" 36" 40" 45" 54" 54"
Longer shoelaces needed than those for basic Criss Cross Lacing. Shorter ends if existing shoelaces are re-used (−12% on average). "I stop at the second from the top eye and then on the same side of the shoe pass it through the top eye forming a loop. 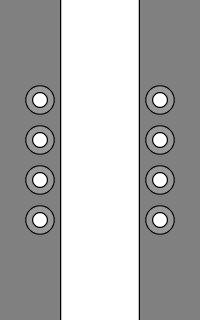 The lace is then passed through the loop formed on the opposite side. A bow is then tied but it has no weight on it because of the previous instruction. If the knot does become undone it will not slip, hopefully. I was shown this method by a woman at 'Just Comfort' shoes, Stones Corner, Qld." "i also randomly discovered that ladder lacing combines PERFECTLY with lock lacing. 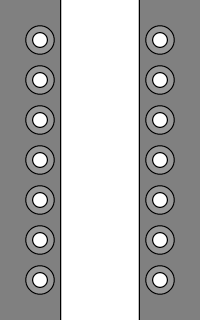 since ladder lacing forms loops between all the eyelets, you can use the last one for lock lacing. my shoes have never felt tighter than they do now in this configuration." "I do have one comment on Lock Lacing. What you describe as the negative feature -- harder to loosen -- is actually why it's a useful technique. The laces below the lock area are pretty much isolated from the area above -- if one is not using one of your improved tying methods and the shoe comes untied, the forefoot won't loosen up very fast, or at all. Because of my physiology, when I used this lacing method, I use it for exactly the opposite of what you say it's most useful for. I need the top bit to not be tight (high instep and heel bumps) but like the forefoot tight, especially with racing flats. with lock lacing, I can do that." "I recently ran the Ridge to Bridge Marathon in the mountains of North Carolina, USA (I live in Greensboro, NC, USA). This race is unique because the first 14 miles are downhill. The race director suggested using the lock lacing method to keep the shoe snug and to prevent the loosening of the laces since it was so much down hill. I used the method and it worked great." "I must take exception to a comment you have regarding "Lock Lacing". You seem to be of the opinion that it is not the answer if there is some heel movement in a running shoe. I disagree, in certain circumstances. If there is very minor slippage, it makes a world of difference. If the fit is way too wide for the person's heel, the heel will still move. There are many runners who use "Lock Lacing" – so many that it's actually referred to as the "Heel Lock" over here - with no adverse effects, including me. The problem with switching to another shoe that fits the heel more snugly is that the make or model may not suit the runner. Every company uses a different cushioning system and some use different systems in each model. Shoes that fit the heels slightly better are not going to be any good if the cushioning system is such that the runner can't or won't wear them. For example, Saucony running shoes fit my heel better than either Reebok or ASICS, but I can't wear Sauconys because the cushioning does not suit the way I land: my forefoot goes numb within a couple of kilometres. I don't have that problem with any other make of running shoe I've tried. "Lock Lacing" allows me to use other models that would cause blisters otherwise. It is a simple and effective answer for many." "Also been recommending lock lacing to our customers buying running shoes, as it works really well for me. I also use it on my etnies as a good way to finish the bar lacing as I have an odd number of eyelets (as pictured)"
"I was trying on a pair of Ecco Shoes that I really liked but the heal was slipping, The young salesman said, "let me try a different lacing" and did a lock type at the top of the shoe. It was remarkable how it not only lessened the slippage but also solved a problem I have had with tied shoes for 60 years. I have an overly sensitive area at the top of my foot. Most shoes that are tied tight put pressure on that area and result in discomfort, the lock lacing doesn't do that." "Even with a regularly tied bow, the shoelaces were still too long. Both the bow and the loose ends were almost touching the floor. So I googled some solutions, stumbled across your site again, and decided to try Lock Lacing because it took advantage of an extra eyelet on the side of my shoe that wasn't laced up yet. I will recommend Lock Lacing for those whose shoelaces are just a bit too long." "I have recently retrained as an EMT, which involves wearing boots and standing for long periods of time. Initially, I found my uniform boots were very uncomfortable. I was then directed to your site by an online EMT resource. As a result of this I tried a different method of lacing, the gap lacing method, with the lace lock to finish. I cant believe they're the same boots! This has made them so much more comfortable and my 12 hour shifts don't cause any foot pain." If you'd like to send feedback about Lock Lacing, please Contact Ian. 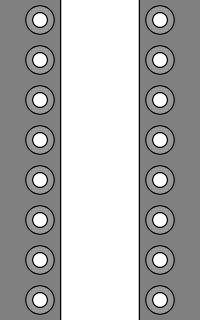 Lock Lacing can be used to overcome the odd-eyelet-pair limitation of Straight Bar Lacing. This page last updated: 09-Feb-2019. Copyright © 2005-2019 by Ian W. Fieggen. All rights reserved.